Believe it or not, I did not grow up eating Asian foods. I was in high school before I ate at a Chinese restaurant. Thirteen years ago or so is when I had my first taste of Thai food. Korean–that was around a decade ago. Japanese and Indian–I started eating those regularly about a decade ago as well. However, though I may have been a late bloomer, I made up for lost time by taking to Asian cuisines like a duck to water, and learning to cook them forthwith, and then eating them as often as once or twice a day. I now have a pantry filled with an array of ingredients, condiments, sauces and preserved items that are used to create delicious and mostly healthful Asian foods. In looking at them mindfully, I realize that many of these items are loaded with naturally occuring glutamate and amino acids, and when used as they have been in Asia for centuries, as flavor enhancers, they make good foods taste great. One can group these ingredients into several categories, and in order to talk about them in some sort of sensible way, that is what I have done. The largest grouping is that which is derived in some way from soybeans, but the next largest group, the ocean-derived ingredients, includes what may be the single greatest source of natural umami ever, the queen of the Thai kitchen, fish sauce. A third group is one where I put together condiments and ingredients based on fermented grains, fermented and preserved vegetables, fresh and dried mushrooms, and finally, toasted nuts and seeds. Soy sauce is the first obvious member of the umami-bearing fermented soybean products in this group, and is most likely to be found in everyone’s kitchen. As many a casserole-combining Mom in the 1970’s discovered, soy sauce enhances the flavor of just about anything, except maybe cold breakfast cereal and cookies. (However, when I put duck sauce into a batch of cookies on a whim once, it contained soy sauce, and the cookies tasted awfully good.) 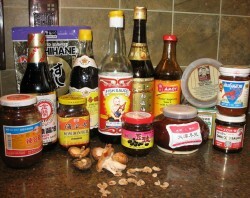 There are various types of soy sauce, all serving different functions. I think that I have about seven different kinds in my kitchen, and while that may be a bit much for most people, they all serve different functions. 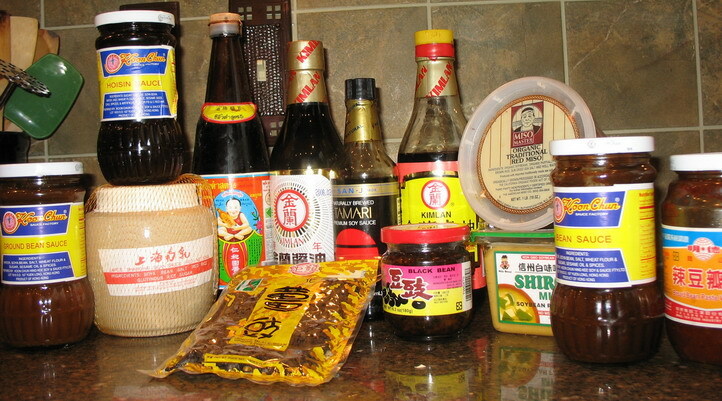 For Chinese cooking, I prefer the Kimlan premium aged soy sauce, and their dark soy sauce. I keep a jar of Koon Chun brand thick soy sauce, which is dark soy that has been mixed with molasses, in order to make fried rice dark and reddish brown. (That is how it is done in restaurants, btw–if you add enough thin soy sauce to make it that color, it will taste like you are eating rock salt.) I also have tamari soy sauce for when my gluten-sensitive friends come over–it is made only with soy, and no wheat, and I have both Japanese soy sauce and Thai black soy sauce, which is similar to Chinese thick soy sauce, but it has a different flavor. Many people identify soy sauce as the primary source of salty taste in Asian cooking, but that is only part of the story. As a fermented product, it is loaded with natural glutamate, and it acts to enhance the natural flavors of foods, and brings a savory quality to everything that is marinated in it or sauced with it. In my experience, most Japanese soy sauces have purer, clearer salt flavors, with less of the umami character that defines Chinese soy sauces. I say most–there are some preium Japanese brands that are just as complex and filled with umami as the Chinese types. As for what brand of tamari I use San-J and for regular Japanese soy sauce, when I use it, I use Kikkoman’s premium, naturally brewed shoyu. Miso is another soy-based staple in my kitchen. It is a thick, fragrant paste made from soy beans and often grain, inoculated with a beneficial bacteria which then ferments them, creating an end result with a fantastically complex flavor and character that is highly variable depending on what sort of conditions it is fermented under, how long it undergoes fermentation and how it is treated during fermentation. There are lots of different types of miso, and they are all different, but it is simplest to categorize them into “aka” or red miso, and “shiro” or white miso. Aka miso is very deeply colored–usually a brick reddish brown, highly salty and very, very flavorful. It is strong, and is used in soups and simmered dishes. Shiro miso is either a creamy color, or yellowish, and it is much lighter in flavor and fragrance. I like to use it in marinades for chicken and sauces for eggplant and fish, or in miso soups with mushrooms and wakame seaweed. Not to be outdone, the Chinese have many fermented soy bean sauces and pastes of their own, all of which taste and smell different and add different characters to the dishes they are used in. Kung Chun has many different varieties, but one of my favorites are hoisin, which is a mixture of feremented soybean paste, sugar and fruit, and is used not only in cooking but as a table sauce with roasted duck and bao bing pancakes with mushu fillings. Hoisin is a delightful sauce, but it can be overused, and in many Chinese American restaurants, in my opinion, it is, and often, it is the reason that the brown sauces all taste the same–sweet, thick and somewhat gloppy. Overuse of hoisin will quickly turn me off of a restaurant. Bean sauce, sweet bean sauce, and ground bean sauce are all medium brown sauces based on fermented soy beans. They are responsible for bringing the characteristic flavor to zha jiang mein–noodles with Beijing meat sauce. I remember when I first tried to make the dish, I substituted shiro miso in the sauce. Black beans pair naturally with the strong flavors of garlic and onions, and in fact, there is a jarred sauce available under many brands that can be used to give the flavor of both black beans and garlic–garlic black bean sauce. (Original name, huh? What you see is what you get.) I don’t use it much, except when I am doing up a super quick wokful of leftovers or to flavor up a bowl of ramen, as I like more control over how much black bean and how much garlic go into my cooking, but lots of people love the sauce. People wouldn’t think that the very bland flavor of tofu has much in the way of umami, and that is true of most sorts of tofu. The glutamate in soybeans is bound up and needs to be fermented to be released, so plain old regular tofu is just as pure and simple in flavor as edamame–steamed or boiled soybeans. But, if you ferment tofu, you get a number of different products, variously called “stinky tofu,” “red tofu,” and “fermented pungent tofu.” It is often highly spiced with garlic, ginger and chile, and is sold in small packets or jars, tightly sealed, because it is rather on the stinky side. It is considered to be an aquired taste, and it can be cooked on its own, or chopped up and used to season a dish composed of other ingredients. Zak accidentally bought fermented tofu once when I sent him to get pressed tofu. When I opened the package, I figured the mistake, but I put it in the dish of pork stir fried with choy sum. Neither Zak nor Morganna could abide the tofu–it was too stinky for them. So, I ate it. And at first, I found it to be nose-wrinklingly icky, but later, as I continued to eat, I began to feel it become very moreish in flavor–the more I ate, the more I wanted it. The stink lessened and the umami kicked in, and it began to taste at once both sweet and savory and downright good. However, the smell of it lingered in the house for a couple of days so Zak and Morganna put down their collective feet (which they liked the tofu smell to) and said that I wasn’t allowed to cook with it any more. So, that is one umami-filled food that will no longer be gracing our kitchen. What they don’t know, but clever readers can see from the picture above is that I have one lonely jar of it I sneaked into the cart at the Chinese market the last time we were in Columbus. I figure that I can have a sneaky few bites at least, now and then in a bowl of soup or noodles, if I am careful not to breathe on anyone until I have brushed my teeth. Look for a continuation in this series later, when I outline the umami flavors from the oceans of the East. I am not at all a sophisticated cook of any sort of asian food, though I have plans/hopes to learn more. Somehow, though, I managed to develop a demented passion for fermented black beans, and add them to some dishes which I imagine would raise a few eyebrows. For example, I like them a lot in kasha, and with barley and mushrooms. I have been buying the ones in the cartons, as I didn’t know the others were better. I will try them next time. I like the plain white brined “fermented bean curd”, though I rarely use it as a cooking ingredient. At home we smoosh it up and dip steamed vegetables in it at the table. Spinach, long beans, green beans and pea pods are the favourites, and I think it beats the capful of vinegar. “Stinky tofu”, called “Chou dofu” in mandarin, is a favorite snack in taiwan. I was determined to actually try it my last time there this summer. I asked my teachers, my aunt, my uncle, friend’s relatives where I should go and every single person had their “stinky tofu” street vendor (it is certainly a street food) to recommend. I actually really liked it–the texture was great, it was a thick sponge like taste. I didn’t mind the stink after a few minutes either. Lindy–I think that fermented black beans would be awesome with kasha and mushrooms–they certainly pair beautifully with mushrooms and rice, so I don’t see why not. If you ever have questions about cooking Asian food, let me know–feel free to post them. If I don’t know the answer, I can usually find it out, or find someone who knows. I like it when I get asked things I don’t know, because it gives me an excuse to research something I might not have thought of researching before. Persimmon–I am fearful of what your grandmother would have thought if she smelled raclette. Talk about stinky feet cheese! I was talked into teaching a raclette class at Sur La Table, so I had to figure out how it worked and all of that (you melt cheese and put it on potatoes and grilled sausages–for this there needs to be a class? Aiya!) so I bought some in downtown Columbus and drove home with it, with my daughter in the back seat with it. She was complaining about the smell, even with the windows down as the autumn air slowly warmed the cheese to room, I mean, car-temperature. It was pretty strong. Oddly, most of the smell was in the waxed rind, which you cut off. After we trimmed it before the class, it smelled fine and it tasted quite pleasant. Rose–I really liked the spongey texture of the fermented tofu, too! I thought it felt neat and really, the more I ate it, the better it tasted. But I like thousand year old eggs, too–which makes Zak shudder when he watches me eat them. But they are good! I keep telling him, and he keeps shaking his head. He at least believes me when I tell him that chicken feet are good. But he still won’t taste them. Silly man. I too love the taste of any dish I have had at a restaurant with black bean sauce. I wanted to replicate the same flavor at home so I bought something in a little jar called “Preserved Black bean” Its ingredients are black beans, sugar,salt, msg, soybean oil and the inside texture reminds me of black beans that were crushed into a thick almost paste substance. I was hoping for the fermented black beans that are featured in a few of you recipes but i’m not sure if its the same. In the picture above you seem to have something similar…I can’t read everything on it but it says “black bean” on it. Did I get the right thing? Or do I need to get something different? Stefan, fermented black beans like I use in my recipes come in either little cellophane packets that are clear with Chinese writing on them, or in cardboard oatmeal carton looking things–cylindrical boxes in yellow, white and red. I prefer the kind in the cellophane packets–they have black and yellow writing and designs on them. What you got was prepared fermented black bean sauce which isn’t as good because they are saltier. The ones in the cylinder box are saltier and drier, the ones in the packet are less salty and more moist and flavorful.